Happy New Year from all of us at nenuno and with the new year, we bring you an inspiration gallery called Teespiraiton! This has been in my mind for quite some time, so when the holidays approached I decided to focus all my time and energy in getting it up and running, but sadly couldn’t post on nenuno whilst working on it. With the majority of the functionality finalised I can carry on working on both projects side by side. 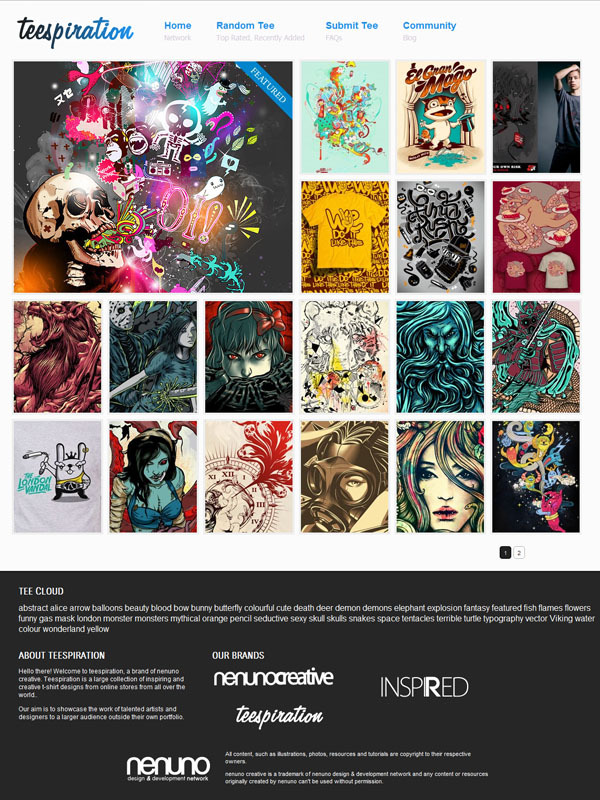 Teespiration’s aim is very similar to nenuno creative, we want to promote T-shirt designs from artists and designers from all over the world with the ability to let the users vote for there favourite tee design. I am planning to add numerous features in the near future and here is the list of what’s currently available at the moment and what I am planning to add. Vote for your favourite tee design. Option to buy the tee if its available for resale. View the designs you have voted for (registered users only). See the most viewed designs.. Featured design will be auto generated weekly. I am really excited to see how Teespiration spans out over the next few months and I hope you will enjoy visiting Teespiration as much as you do with nenuno creative. With a successful launch on the 30th December 2010, all tee related content I produce from now on will sololy be published on Teespiration. If you love t-shirt designs as much as I do and have experience in WordPress, I would love to hear from you! I am always looking for assistance and Teespiration will be (fingers crossed) a soon to be very popular inspiration gallery for tee lovers. Appreciate it for this marvellous post, I am glad I discovered this website on yahoo.